The arid karstic island of Astypalea - Αστυπάλαια - Astypalaia - Astipalaia, the most westerly of the Dodecanese, shows clear affinities in both landscape and culture with the Cyclades. 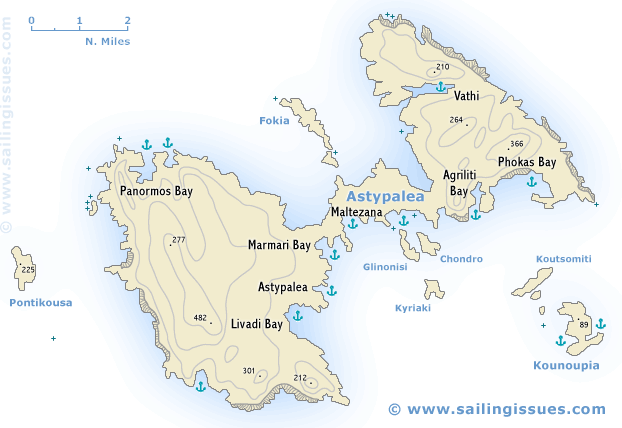 Two wide bays on the north-west and south-east sides divide the island into a higher western half and a lower eastern half, joined by the Ayios Andreas Isthmus, which is only 110 m wide. Stock farming (cheese), fruit- and vegetable-growing and fishing bring the inhabitants a modest degree of well-being. The picturesque village of Astypalea, dominated by a Venetian castle (13th-16th c), is situated on a bare rocky hill above its little port. South-west is the fertile Livadi valley, the island's main agricultural area. Scattered over the island are some 200 little churches and chapels, most of them founded by private citizens and many of them in a state of despair. Some of the many neighbouring rocky islets are used for the grazing of goats.